I have answered a couple questions as they have been asked (and updated the first blog post of the month), but thought a couple things might be worth repeating. Your PINK fabric may be light, medium or dark in value, soft or bright in tone. 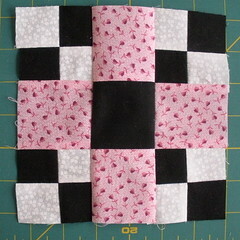 Any PINK will do for these blocks. The one thing these blocks all have in common is that they all share a Black (or black and white) “X” through the center. We aren’t making blocks with white paths this month.